Life cycle of a Jellyfish. The life cycle of an organism is the cyclic process of reproduction from the beginning of life to the return to the starting state. 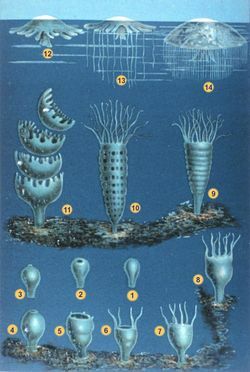 The process involves a series of changes in form that an organism undergoes, and may involve growth, metamorphosis, asexual reproduction, and/or sexual reproduction. Alternation of generations is the mode of reproduction used by all plants, but most notably in ferns, mosses, liverworts, and hornworts. It is characterized by two distinct stages and involves both sexual and asexual reproduction. The Gametophyte stage creates male and female gametes, which then unite to form a sporophyte. The sporophyte then uses asexual reproduction to create spores which in turn germinate into the gametophyte. 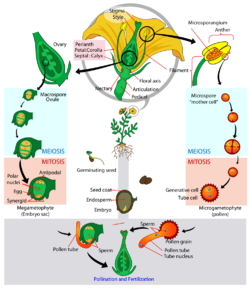 ↑ Biological life cycle Wikipedia, Accessed August 4, 2014. ↑ Alternation of generation Wikipedia, Accessed August 4, 2014. This page was last modified on 4 August 2014, at 21:57.